It has been a while since I have been able to link up with two of my BBB's.. the Collaboration Cuties! 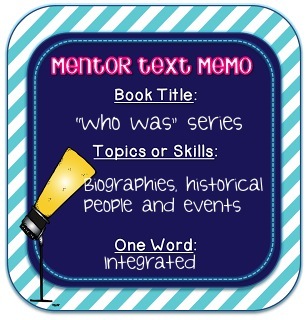 I absolutely LOVE their Mentor Text linky, and I have gotten so many great teaching ideas from it! 1.) Order the Social Studies Weekly program that is aligned with Common Core-- It is a great, interesting, and engaging newspaper type resource that students read and we complete activities with. It is great for Daily 5 buddy reading! 2.) Order a class set of the "Who Was" books. I absolutely LOVE these books. Have you heard of them? If not, I suggest you go to Target right now and pick one up! I first learned about these last year during our Famous American project. I wanted to get biographies on the Famous Americans my students were studying that were kid-friendly, and could be used for research by 4th graders. I stumbled across the "Who Was Abraham Lincoln?" and I fell in love! So did my students! This year, I plan to start integrating these books into Language Arts from the beginning of the year. I also plan to integrate these during our biography unit, which is a big part of our common core 4th grade standards! I actually just read the Who Was J.K. Rowling book for fun (since I am OBSESSED with Harry Potter) and it was SO interesting. I bought a copy for my classroom library! Do you have any great Social Studies books you use? Head on over to the Cuties and link up! I'd love to learn from you! Love this series of bios! I read aloud the Jim Henson one to my kids each year! Reading your post makes me want to add some more to our classroom library... Thanks so much for sharing! They are WONDERFUL books :) I'll have to pick that one up! I love this series! Our 3rd grade teacher has the entire set and uses them a lot so I don't get to use them much, but I do use them at different points during the year. I didn't know there was a J.K. Rowling one! I too love Harry Potter and will have to check that book out for me! I LOVE this series and so do my students! I call them the bobblehead books. They are easy to read and give great info on the person or event it is about. I'm so glad you could link up! Congratulations on your blogiversary! !